Ride through open fields on horseback and then soar over Kauai's lush countryside on 3 ziplines. Connect with nature and explore Kauai's most popular ranch. Your tour starts as you soak up the stunning mountain scenery on a leisurely 30-minute horseback ride. Then get ready to fly on three fast and fun ziplines, the longest of which is 700 feet of pure excitement! Zip off the edge of the valley, soar over treetops and feel the wind in your face as you witness the splendor of the ranch below. After you are done zipping and zooming through the tree tops, your unique adventure wraps up with another peaceful 30-minute horseback ride back to the stables. After a brief introduction to horseback riding fundamentals, saddle up for a scenic ride through Kaui's breathtaking countryside. Sail through the air from point to point on ziplines spanning one of Kauai's most charming stretches of ranch land. The final zipline, aptly dubbed the "Big Kahuna," runs for 700 feet and allows two participants to zip side by side. Unwind from the excitement of ziplining with an unstructured trail ride across open fields and sprawling landscapes that will form the backdrop of memories to cherish for years to come. Children ages 10 to 15 must be accompanied by an adult who is at least 18 years old. 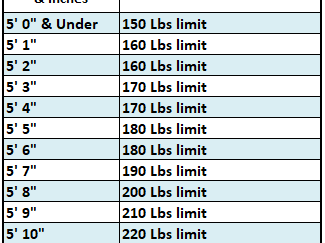 All participants must fall within the weight and height guidelines. See the attached image to ensure that you fall within a yellow box on the chart. Hiking is rated moderate and you must be able to walk just over one mile on uneven terrain. Tour is not recommended for people with recent injuries or surgeries. Please be aware that participants may get muddy. A GoPro is available to rent for 39.95 USD upon arrival at Princeville Ranch. Guests will get to keep the SD card of the tour. Do both activities need to be scheduled for the same day? Yes! The Ride N Glide tour is a combination of two (2) ranch tours. The ziplines are approximately 150 feet above the valley floor. Okole Hau - 410 ft.
Big Kahuna - 700 ft.
Lele Pali - 560 ft.
Our 2nd time even better than the first!